Lancaster City slipped to a second defeat in three days to fellow mid-table outfit Nantwich Town on Tuesday evening. A double from Sean Cooke ensured all three points for the Cheshire side in a match full of controversy at Giant Axe. Fleetwood loanee Mamadou Djabi had equalised for City late in the opening half before a strong penalty appeal was waved away, captain Ricky Mercer then seeing red for an off-the-ball incident in the second half to compound the Dolly Blues’ misery. Cooke opened the scoring early in a relatively low-key first period. Having scored twice in the 3-0 win over City at the Weaver Stadium on Saturday, his free-kick 20 yards from goal was placed inside the near post as the visitors converted a rare first-half chance. Neither side looked particularly great on the ball with possession readily surrendered by both teams throughout the match, and the lack of chances created by either side showed. City were level with their first effort on target after 39 minutes however. Paul Dugdale’s marauding run found him in space inside the box and his shot was only parried into the path of Djabi to calmly convert first-time into an unguarded net. The biggest talking point of the game arrived just two minutes later when Tom Kilifin was played through on goal through the centre of the defence. With just the ‘keeper to beat the striker appeared to be brought down from behind, City’s appeals waved away with play continuing. To compound Lancaster’s frustration the Dabbers went back in front early in the second half. Cooke was picked out with a low cross on the edge of the box and he made no mistake with a cool first-time strike that curled over Josh Powell into the left-hand corner. Phil Brown’s side were then reduced to 10 men when Mercer was sent off for the Dolly Blues. In a crowded penalty area the City defender tangled with a Dabbers player and was adjudged to have raised an arm in the ensuing handbags leading to him being given his marching orders. 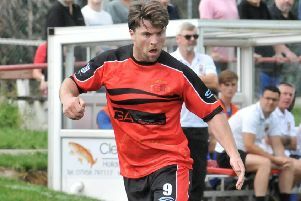 Ten-man Lancaster fought valiantly to rescue a point in the final stages with Simon Wills and Craig Carney both going close from distance, but it wasn’t to be with the Dollies now having won one of their last seven games in the Evo-Stik Premier Division. Lancaster City: Powell, Hudson, Steel, Mercer, Clark, Dugdale, Carney, Wills, Jarvis, Kilifin, Djabi.